I have located a Greco LP copy. It's not at hand, so I'll have to describe it. I have two pics. I'll try to post the pics in a few minutes. 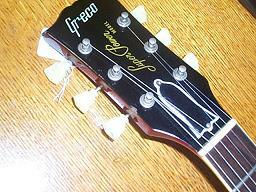 I have 2 Greco strats from the late 70`s that I really like a lot. 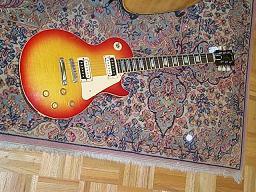 Don`t have a LP type but there are quite a few around... I`m more interested in the 70`s or 80`s guitars from Japan at this time. Grecos from that period were very well made and sought after in Japan. based on my strats, the first 2 digits of the serial number are the year of manufacture. Don`t know if they did the same with LP`s or changed the system at some point. For the Greco's, one quick way i can tell the approx date is to look for clues on headstock 'emblems'. Judging by yours, I would say early to mid 80's. Other emblems on Greco's I do believe are Leopald, Super Grade, (actual gibson diamond on customs) and i think another Super something. Thank you both! Seems to be very little data available in my Google searches.